Swedana (also spelled as Svedana) is a Sanskrit word, which means perspire or sweating. The various techniques that induce sweating are known as Swedana karma. Swedana can induce hemodynamic changes in the body. First, it increases blood pressure and heart rate or pulse rate. These changes are just for a short period. After that, it can also reduce systolic blood pressure. It also improves blood circulation and removes toxic substances through sweating. 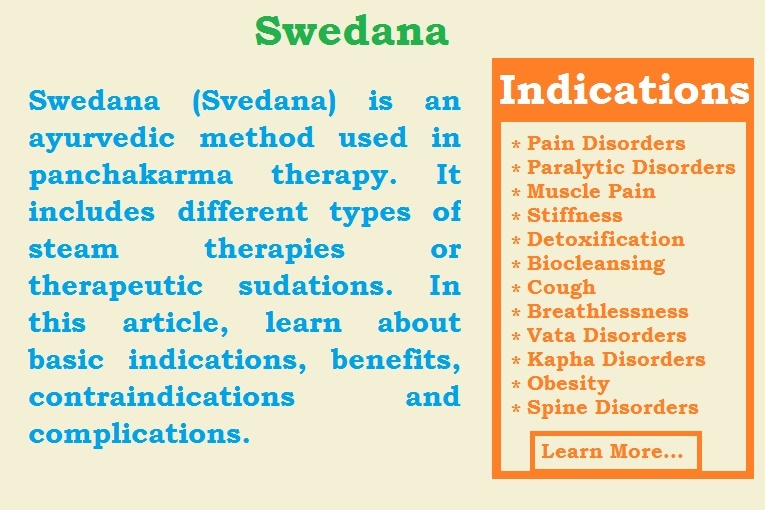 Swedana is beneficial in following health conditions. Swedana (sudation therapy) is not appropriate in following cases and conditions. Note: Swedana (sudation therapy) is not suitable for following body organs and you should cover these parts with towel, flowers or leaves etc. + Note: Mild Swedana is reported beneficial in diabetes mellitus complications including diabetic neuropathy. Therefore, we can use mild sudation for diabetic patient with good diabetes control, but strong sudation is always contraindicated. In uncontrolled diabetes, mild sudation is also contraindicated. Excess sudation or excessive use of Swedana therapy can cause following complications. The management of complications of Swedana involves.